Coono iOS 7 Jailbreak Tweak: Color up your iOS Notification Banner! Bored of iOS 7 banner notifications’ monotonous look and feel? Well, no more! Another of our genius iOS jailbreaking community members has tried to bring in some much needed colors in our iExperience. Conno iOS 7 jailbreak tweak takes the dominant color or app’s icon and paints its shade across that app’s notifications. This revamps the entire look of monotonous stream of notifications. The Coono notification iOS 7 jailbreak tweak washes the entire banner with app’s color. This also makes it rather easier to relate notifications to apps quickly. Although you cannot really tweak the app to manually set the colors or something, but it works rather beautifully with managing colors. At times, colors do seem to be brighter but definitely give the entire notification banner a new and colorful look. 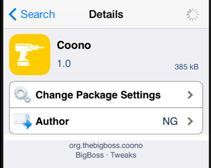 You can get Coono iOS 7 jailbreak tweak for $1.50 from Cydia in the BigBoss repo. Add a little color to your iOS devices with this notification iOS 7 jailbreak tweak. Too Many Screenshots to take? Here are the Top 2 iOS 7 Jailbreak Screenshot Tweaks! Aura and Other Popular iOS 7 Winterboard Themes – The Best So Far! The popular Springtomize 3 iOS 7 Jailbreak Tweak is Now Available! Add Customized Fifth Row with iPhone iOS 7 Keyboard Jailbreak Tweak! iOS 7 Jailbreak Dock Tweak – How to Add an Extra App on your iPad or iPhone’s Dock!